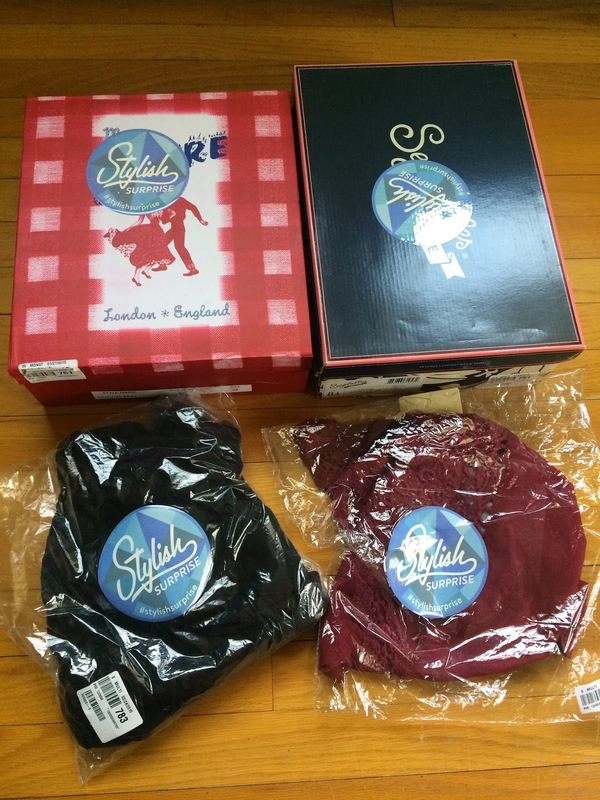 Modcloth announced their Stylish Surprise sale a few weeks ago, and I purchased immediately. This time the prices were a little different. Shoes were $10, so I ordered 2 (I can't resist the shoes and luckily they still had my size when I realized the sale had started). I always miss out on accessories and house stuff. Those always sell out the quickest. I was also able to snag an apparel item for $15 and a dress for $20. Luckily these ship out pretty quick, so the wait until the box arrives is not too bad. I do love when the box finally arrives and I can rip into it to see what I got. I am always secretly hoping for a coat when I order the apparel (because I love the coat I received last year and wear it all the time). So here is a picture of what I got! It looked promising and the Seychelles shoe box (even though I hadn't seen what shoes were in it) made it worth the purchase already. They are one of my favorite shoe brands and I often buy the brand at full price. Plus I knew they would fit. The sizing is a bit off with some of the brands Modcloth carries, so I'm always worried the items I get won't fit in my normal size. 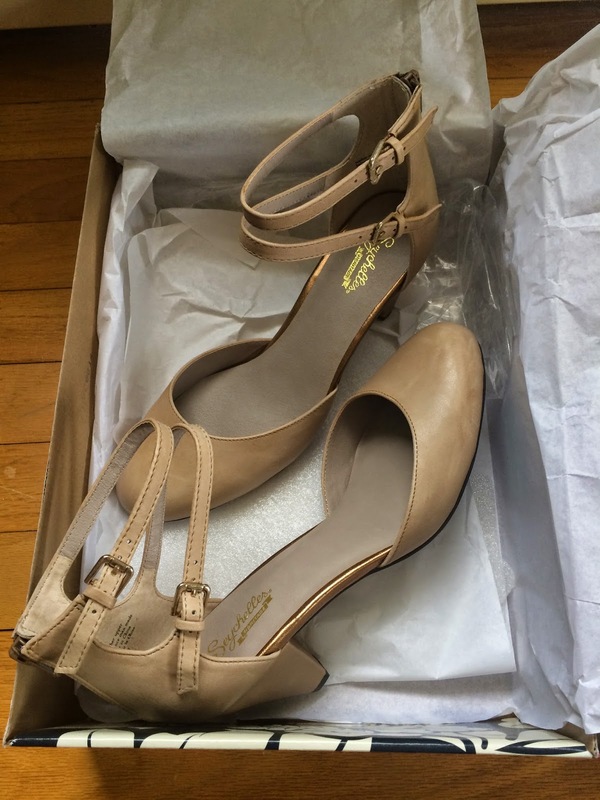 So, the first item I received, and my favorite item was the Seychelles Marvel Taupe leather shoes. I love the classic shape with the ankle straps and the not too high heel. These are perfectly my style and I will definitely get a lot of wear out of the neutral color. I knew it didn't matter what else I received, because I was happy I got these shoes! 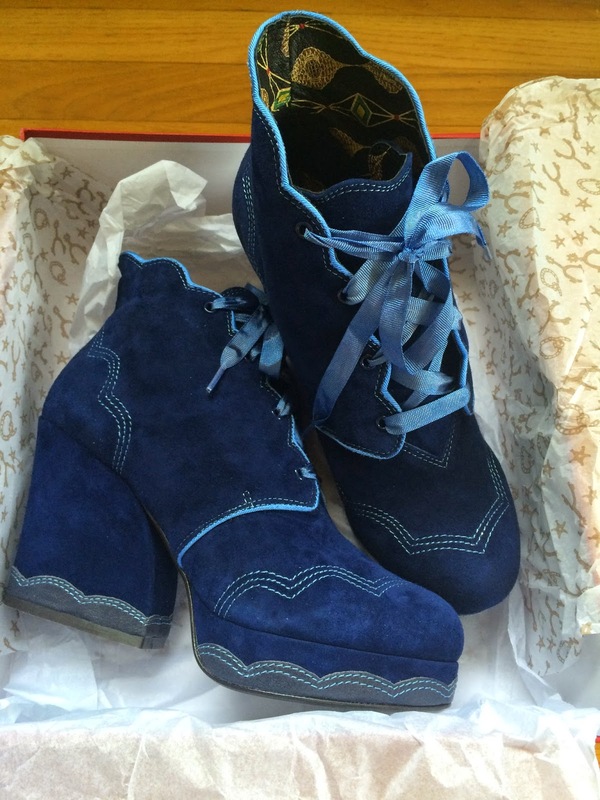 The other shoes I received were Miss L-Fire Central Park Blue shoes. These made me smile when I opened the box! And they fit perfectly. And though many people have contacted me because they want me to trade these shoes, I just can't seem to get rid of them. The heel and platform bottom, may be out of my comfort zone. They may not be my style and I may not be able to pull these off, but I'm going to try my hardest! These are so irresistibly cute in a very odd way that I can't explain! I must say scalloped details are one of my favorites! 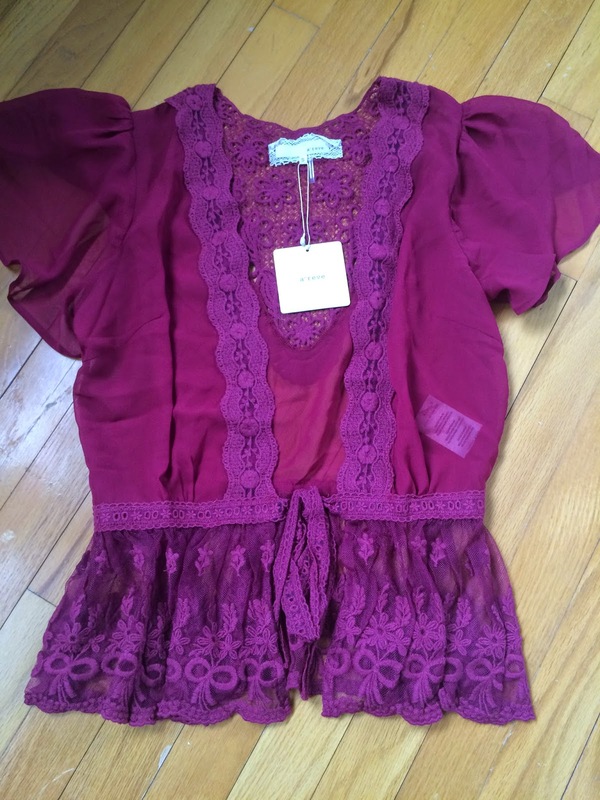 The Stylish Surprise apparel item I received was an a'reve lace cardigan with crochet detail in burgundy. This is very cute and fit nicely. It's a nice peplum cardigan and I love cardigans and peplums, so it was perfect for me, except for the sleeves. I knew I wouldn't wear it often, because it is too cold where I live and this looks like a fall color, so I probably wouldn't reach for it often. I ended up trading this, but it wasn't an easy item to trade, because I really did love it! But it is in a better home now in TX where it will get much more wear! This is the back of the cardigan. The dress I received was by Gilli. It's a black dress with a lace top. I love the flare style of the skirt. It is a little short, but I'll wear it. It's not too crazy and I was happy to see something wearable. Some of the dresses I've seen others receive are too fancy to wear, but mine won't be too difficult to find somewhere to wear it. It'll be perfect for date night or a dinner at a nice restaurant. And it makes me feel like a ballerina when I put it on! 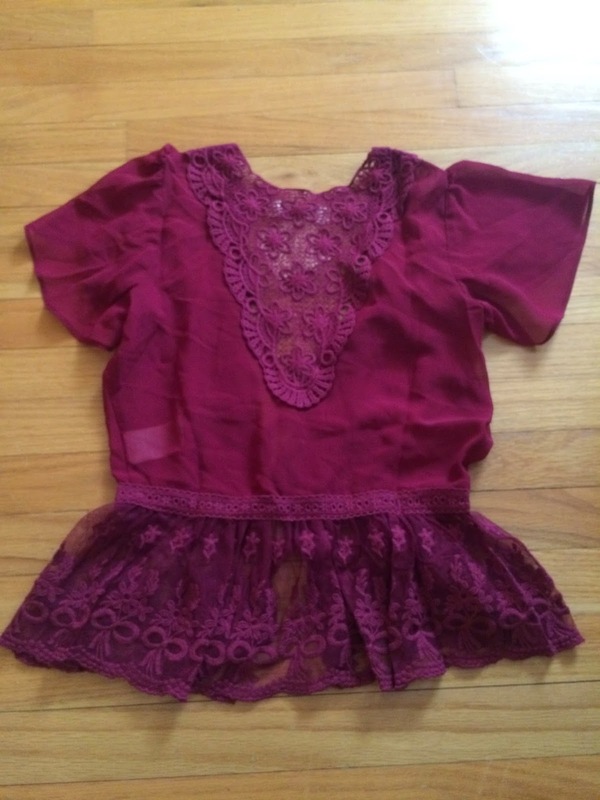 This was a very successful Modcloth Stylish Surprise order. I would have kept and wore every item I received. And though I did trade one item, I think it was for the better. I actually traded for a beautiful yellow coat, that I should be receiving soon. If I love it, I'll post pictures! And because it was so successful, I ordered 2 more apparel items, that should arrive very soon. And I'll review them as soon as I get them. Now, I realize I may be pushing my luck ordering more, so I'm expecting at least one dud, and maybe 2. We'll see!